What a cute book. We never had spelling bees when I was growing up but I wlould've loved it! What fun! My three picks: carrot, book, truck. Thanks. From your daughter's response it sounds like it would make a great gift for a young child! Please enter me! 3 images used in Abigail Spells word matching game is book, bell and cookie. yes, the illustrations are stunning! What a neat book! I love the lesson in the book that winning is not everything. I like the characters of a young chicken with a bear as a best friend. Please enter me. I would love to have this book for my grandkids. The matching game was fun! 3 images were carrot, clock and truck. I also subcribe by email. My kiddos would love this we play spelling bee at home! I think my son is just on the brink to learn how to start reading! Would love to win this! 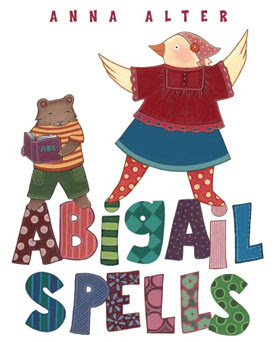 Thanks also for the links to the abigail spells site. I like the Spelling Journal idea on the website. I love watching the spelling bee on TV! I was in a spelling bee in 3rd grade and I won at my grade level! I still remember it and have the plaque! I feel your pain - my word was "sophomore" :). Looks like a cute book!! My tree year old would love this. She tries to spell words and put letters in order. This would be perfect for my pre-K boy who is learning to spell right now. I think this would be a great book for my SD who struggles with spelling issues. I saw a book, a clock and a bell. My daughter has just begun to love spelling everything. She'll ask me to spell just about everything these days. I'm sure she'd love this book and I'd love it for her since I never was a good speller! Three images would be: a cookie, a bell and a clock. Thanks for the giveaway! This sounds like a great book. Growing up, I was a good speller, but the moment I was put on the spot, I froze. I'd love to share a book like this with my son! This looks like a darling book. I love how Anna showcases her creative process for writing/illustrating this book on her website. My daughter would get a big kick out of a spelling chicken! Please include me in your giveaway. I would love to share this great book with my grandson. We would love to share this book with my daughter's teacher and kindergarten class for the end of the year! Three of the imagages were truck, bell and cookie. This would be a great book for my 5 yo niece! I like that it stresses helpfulness and "demphasizes" winning. Competition has it place, but learning is for everyone! Thanks for the chance to win a copy! who ever thought spelling could be so much fun. What a great idea for a picture book. My kids loved the word matching game with the Bell, Cookie & truck). a cookie, a carrot and a book are 3 of the images. I love this book. My picks are cookie, bell and carrot. As an elementary school teacher, I'd love to read this to my students! My niece just was in the spelling bee for her class. it was practice for next year when there will be a spelling bee for her entire grade.. She loved it.. What fun!! the book sounds wonderful. I personally hated spelling, I still do! This is a great book for kids to teach them that spelling is not that bad. Spelling bees can be fun. Happy June! I have loved to spell! I love books that are both educational and fun. Thanks. I have two young grandsons and this book would be ideal for them. I love educational tools. Three images used in the matching game are bell, carrot, and truck! I'm a follower via google reader, thanks! I follow via google reader! Thanks! I went around spelling everything in sight from 6th grade until high school. It was so fun! Three images used in the game are a truck, a clock, and a cookie. Cute! Three of the images I found were book, clock and cookie.